I received a recommendation for this book through a friend (now Young Adult librarian) from college. She described it as a mix of the book Hunger Games (see previous review here) and the film Cube, which is a really trippy sci-fi film from the late 90s. Her description was actually pretty spot on, though I'd probably throw in some references to Golding's Lord of the Flies as well. 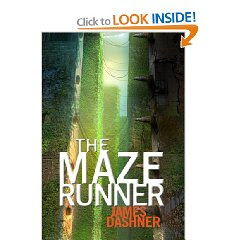 The Maze Runner is the first in Dashner's trilogy and is centered on Thomas, a young man who wakes up one day to find his memory has been erased. He has been transported to a new strange place, called the Glade, which is basically a huge field/meadow in the center of a large and complicated maze. The area is populated solely by teenage boys. Every night the doors surrounding the Glade are shut and the walls of the maze move into a new pattern. Daytime runners try to tease out the puzzle, but must return to the Glade before the doors close or else awful creatures will hunt them down and kill them. Thomas' arrival sparks controversy with the boys as they struggle to find their way out. Seriously, this book was pretty awesome - lots of suspense and action. Though the writing is nothing great, the characters are all fairly multi-dimensional and Thomas is a hero that you genuinely want to root for. All in all, a fast and enjoyable read.